I’m holding a pledge drive! If you’ve been thinking of supporting my patreon, now could be good time to start! Over the last few months, my intent about the future has shifted. I want to make Nwain financially sustainable sooner rather than later. I’ve spent the last two years working full-time to bring this comic to life, yet during that time I’ve been piling guilt on myself. I’ve only been employed part-time during those years, intermittently looking for full-time employment at any games company that was hiring. Still, I felt I wasn’t looking for “real” jobs as hard as I thought I should. I was under a cloud, and that cloud prevented me from seeing the opportunity I’d been building every day for nearly two years. I want to keep making this comic at the same pace. To do that, I need to earn a living at it. I need to make Nwain my job, and treat it like a “real” job. I need to tackle the many-headed hydra of finances head-on. What this means for you, readers, is that I will create more merchandise and other rewards while continuing to bring you the same animated comic. 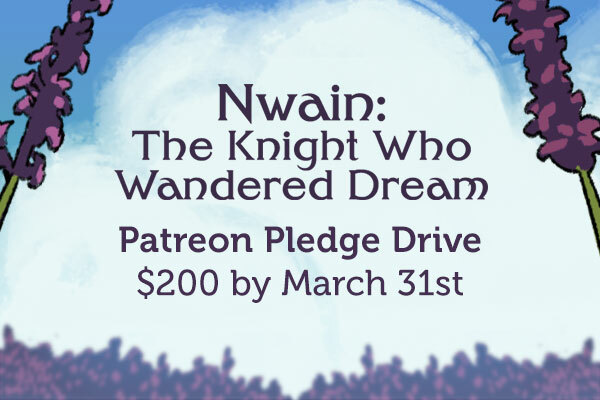 I will also hold a “pledge drive” every few months in an effort to invite more people into the Nwain family. The first pledge drive starts today! 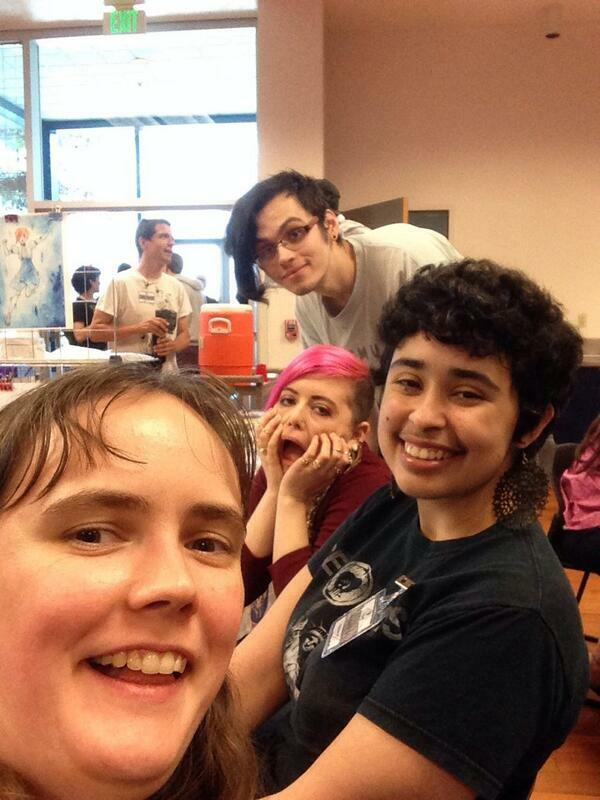 New Patreon Pledge Goal: $100 by October 31! 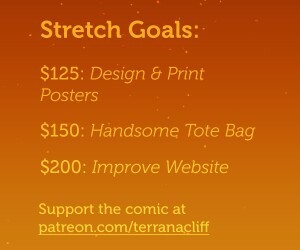 As my Patreon currently sits at $65, this is a modest increase of $35 in 35 days. 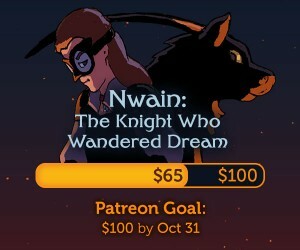 Please tell your friends about Nwain, especially if they like fantasy stories, comics, and/or animation. 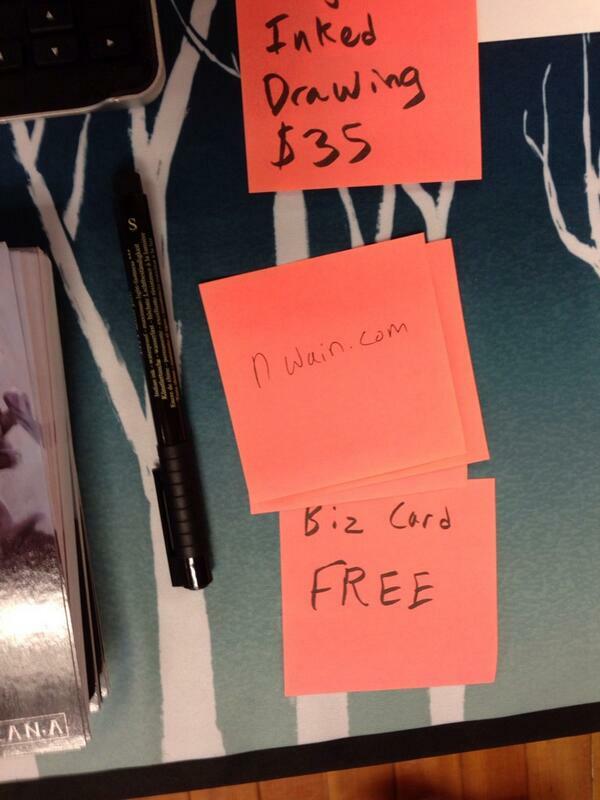 If you considered putting up the Nwain fliers, now’s a good time to go do it! 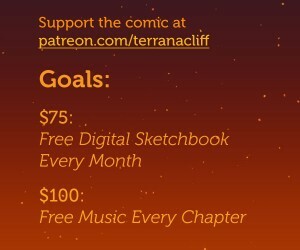 $75: Free Monthly Digital Sketchbook. 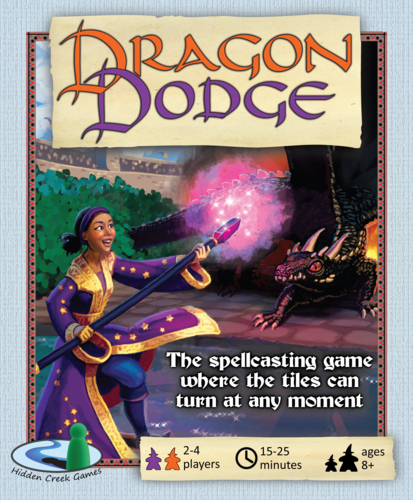 This is a pdf that will release in the middle of the month. It will contain sketches and other art I’m working on. It will be free for anyone to download and share, covered under a Creative Commons share-alike non-commercial license. Producing these will help me compile an artbook later. $100: Free Music For Every Chapter. Each chapter, I will work with musically-inclined friends to create an original soundtrack for Nwain. The music will be freely available online. $125: Design & Print Posters. Getting posters printed requires an upfront cost that I can afford more easily when we reach this goal. $150: Handsome Tote Bag. 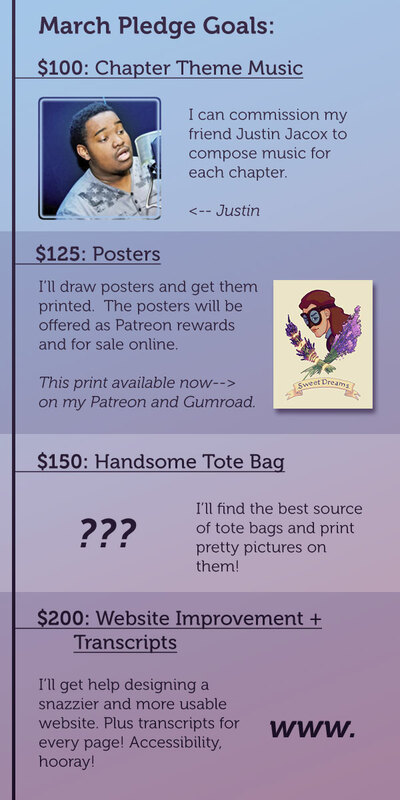 Like posters, tote bags also cost money. When we reach this level, I will quest for the best of the totes. $200: Improve Website. I want to improve usability and access for the site, which will require time and possibly hiring web development help. As one example, I want to make text transcripts for every page, so international readers can use Google translate to read the comic, and low vision readers can use text-to-speech programs to hear the story. Thank you for bearing with me through this long letter. Have a nice week! P.S. : Two new pages go up this Tuesday! 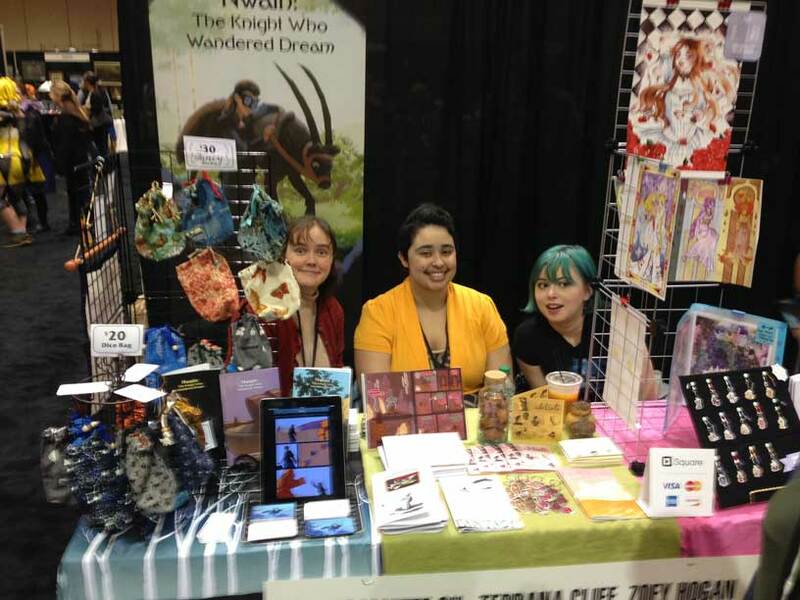 I had a great time at Olympia Comic Fest, next to my buddies Joamette Gil and Zoey Hogan! 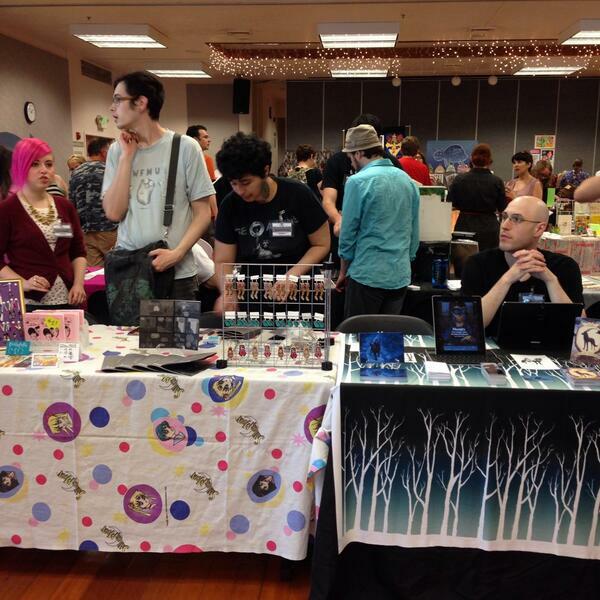 I got to introduce a lot of new people to the comic! 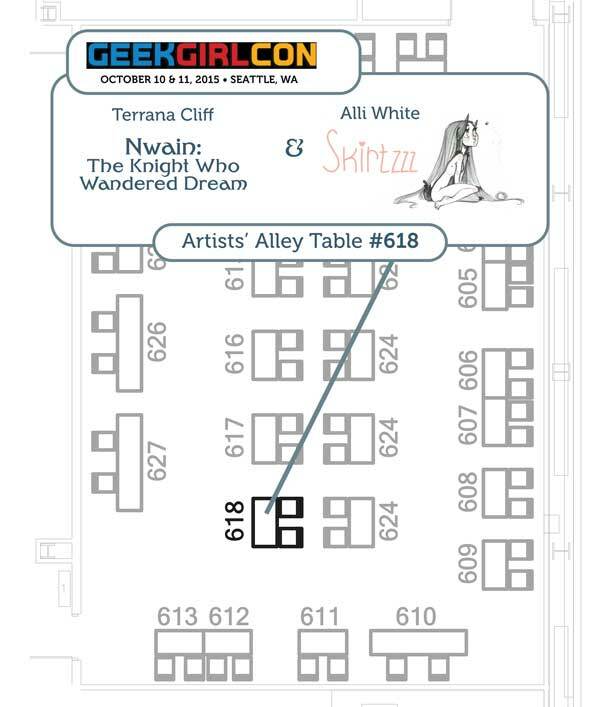 If you’re visiting because of the Oly Comic fest, hello!